Peacock spiders keep dancing their way into our hearts. They're tiny, they're colourful, they're fluffy and they have killer moves. And more are being discovered all the time, thanks in large part to zoologist Jurgen Otto. During the day, Otto works for the Department of Agriculture as an acarologist, specialising in mites and ticks. Observing and cataloguing peacock spiders is a labour of love, and it keeps paying off: Otto and his colleague David Hill have just named and described seven new species of peacock spider, bringing the total number of named species and subspecies of peacock spiders to 67. Almost all of these have been added in the last nine years, each tiny spider with its own distinct colouring and pattern on its abdomen, or opisthosoma. The males, much like their namesake the peacock, are brightly coloured, and fan their tails out in elaborate courtship dances, waving their fuzzy legs in the air. They are smaller than they seem in pictures, too - each spider is just a few millimetres in length. If you live in Australia, you may even have seen them in the bush without realising. Maratus cristatus was found in the south of Western Australia, near the coastal town of Denmark. It has eight tufts of white hair and a distinct pattern of latticed blue and dark orange-red scales on its opisthosoma. Maratus electricus, found in the south of Western Australia at Lake Muir, is a little unusual in that its coloured opisthosoma has no flaps. In most male peacock spiders, these wrap around the abdomen, fanning out during courtship. The iridescent M. electricus does his dance flap-free. Maratus trigonus was found on the southern tip of Western Australia at Mount Lindesay. It gets its name from its unusual shape. Unlike other peacock spiders, whose opisthosoma flaps are rounded in shape, when it dances, M. trigonus' flaps fold out into a triangle, with the top much wider than the base. It's also more subdued in hue, a dark, rich orange brown. Maratus gemmifer was found a little way up the coast from the south of Western Australia, in the Karnup Nature Reserve. Its name means "bearing gems", because the flaps of the male's brilliantly coloured opisthosoma each have a bright, gem-like spot that can only be seen when they're unfurled. It's a member of the species group based on Maratus mungaich, which all have similar colouring. Maratus melindae corus, found in Western Australia's Banksia Reserve, is actually a subspecies of Maratus melindae, also a member of the mungaich group. It looks a lot like M. gemmifer, but if you look closely, you'll see its opisthosoma is lacking the two bright dots, and it has a white patch on the back of its head that M. gemmifer doesn't. Maratus nimbus was collected in Moama, New South Wales, but first photographed in South Australia. It looks quite different from other peacock spiders, which are often vividly-hued. M. nimbus is more pastel, with white patterning on a pale blue background that resembles clouds at dusk - hence its name. It has been found both near water and in more arid environments. 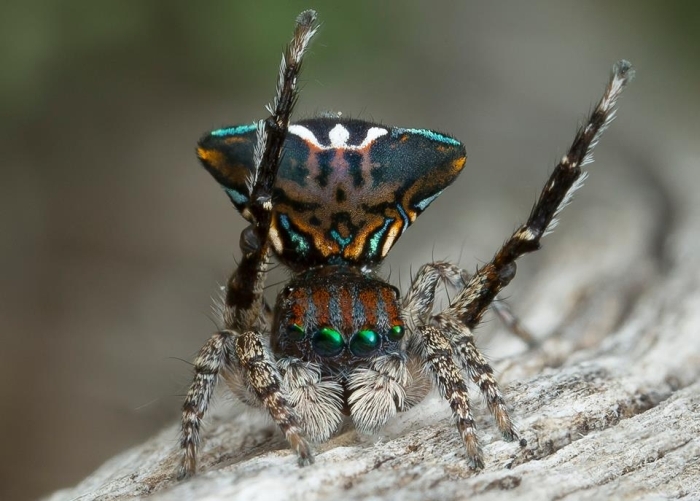 Maratus sapphirus has only been found in a single location - Baraga Bay in New South Wales. That location is also known as the Sapphire Coast. The two bright blue spots resembling sapphires on the flaps of its opisthosoma, coupled with its home habitat, made the name choice obvious. The discovery was published across two papers in Peckhamia. Five spiders were described in the first, and two in the second.